Weather a lot drier and warmer today. We drove the loop around Corcomoroe. Stopped at Kylenoc (sp?) house €10 to see the grounds and the house – hardly worth it. But they did have a nice gift shop – I bought a jade dolphin to add to the collection – and they tried to charge my credit card in US$ – hmm excuse me what country is this again – I’m surprised its even legal – but its definitely a rort – always make sure your card is charged in the currency of the country you happen to be in! We had a pub lunch in Clifden – actually the first time we’ve bought lunch. 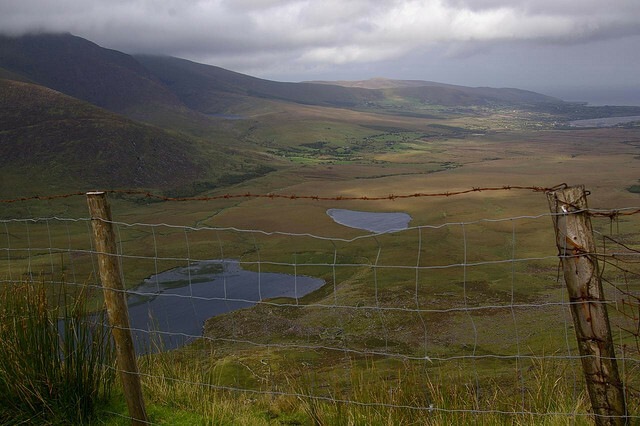 Quite a few more tourists in this part of Ireland – far more than we saw down south. 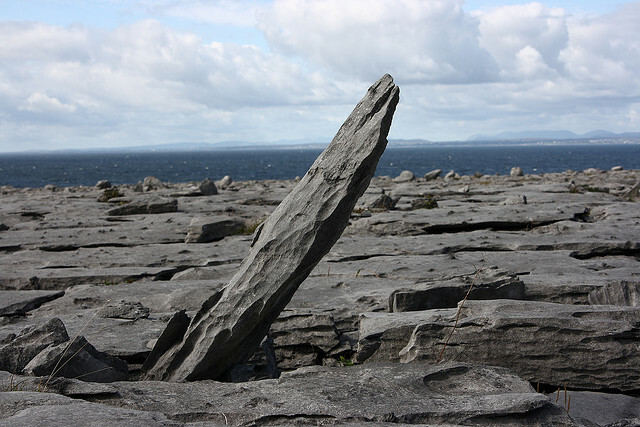 We had to drive back around Galway to get the the Burren – remote and wild limestone country – covered in simple Neolithic tombs – its the history of the place that gets me. The standard B&B in town was charging €60/2 – though we are managing to stay under budget at around €140/2 per day. 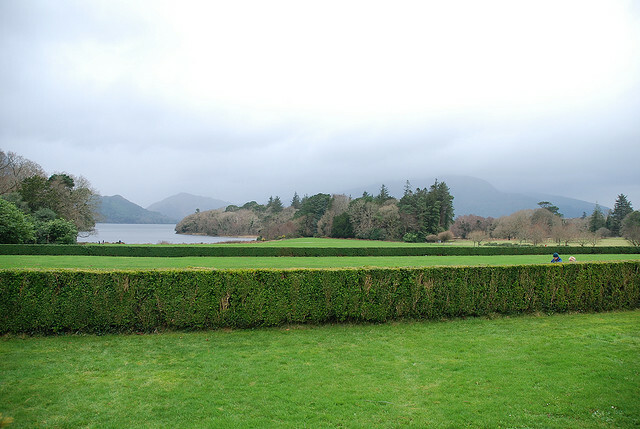 In the morning the weather wasn’t so bad so we went to see the grounds of Muckross House in town. Walked to the bottom of the Torc Waterfall which was about 4km return – and on the return it started raining again. Still cold with snow on the hills. Didn’t go into the house – not sure on the cost – but expensive I should think. Also skipped the pony traps. Raining still in the morning but it did improve during the day. There had been snow on the hills overnight and it was a lot colder and windy compared to what we had been having. Drove the Ring of Kerry the Ring of Beara’s more famous sister. We took a €5 car ferry over to the island of Valentina – the loop around the island showed off some really wild coastline. The Skellig Experience Museum on Valentina was doing at €4.4 pp – the film on the famous Skellig Monastery was excellent – we didn’t get over there though because the rough seas had stopped the boats. 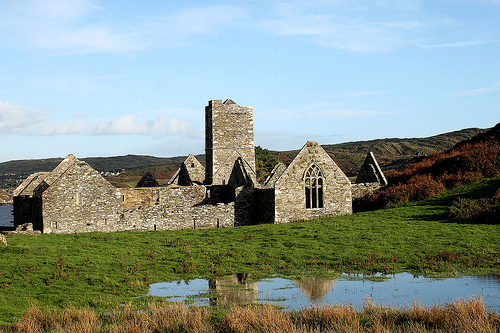 Those early Irish priests really liked their remote locations. We looped around some very minor roads – moss growing in the middle of the road minor – to Portage. We went to Derryrane Park – didn’t pay to go inside but wandered around the grounds. Stopped at Staigie Fort as well – another Iron Age fort a the top of a valley with a nice view down. Driving back took us across the Kerry Peninsular over some very narrow roads – scary if we’d met an American driving on the wrong side of the road coming the other way! 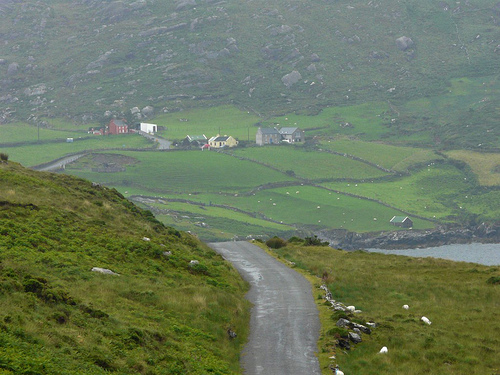 Well this was supposed to be the highlight of driving the Beara Ring – less famous than the Ring of Kerry but apparently arguably even better. Unfortunately I can’t really comment – because through the mist and the rain we didn’t see a lot. And the roads were very narrow so the driver really had to keep their eyes on the road! Its certainly less touristy though – we hardly saw another car. Given the cloud line we didn’t bother with the high road! We’d planned on staying at the youth hostel at Kilkenny – but it was full – so ended up in a B&B on the outskirts at €60/2. Went out for an Indian meal (really tired of eating “Irish” food all the time) – but expensive at €34/2 once we added up the extras. 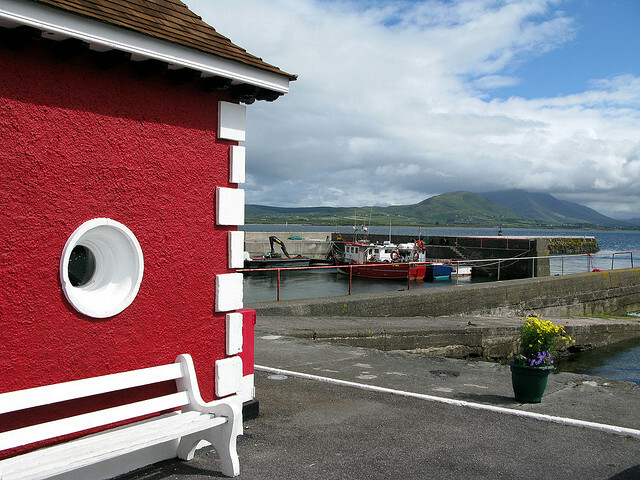 Took the short ferry trip over to Sherkin Island – 15 minutes and €7 pp. Walked the length of the island – three hours. Quiet with very few other tourists – warm and fine weather. Got back to Baltimore about 3pm just as it started to rain. Skibbereen was a bit wet – but did have a supermarket. Stayed at a nice B&B in Glengariff – with a seaview. I think we were the only guests at €28pp. Had a good pub meal and drinks for €34. From the B&B we had a track right to the beach – beautiful sunset. So far we are under budget – the big help is self-catering – and we are surprised at how little we are paying in entrance fees. Skipping over the whole family visiting – kid focused activity bit – we are finally off out of Cork for a tour of the west of Ireland. We are boring a dinky little 2 seater van my brother owns so I can’t tell you much about the cost of hiring a vehicle – but I can tell you you will need your own wheels for this part of the world. There is very limited public transport and we wouldn’t have seen a fraction of what we did if we hadn’t had transport. We left about 9:30am heading south to Kinsale and then on to the southern coast road. Absolutely no tourists to be seen, and lucky that we had been to the supermarket before leaving Perth because there was nowhere open to eat for lunch until we got to Clonkilty. And then 2 soups and 2 coffees cost us E12. 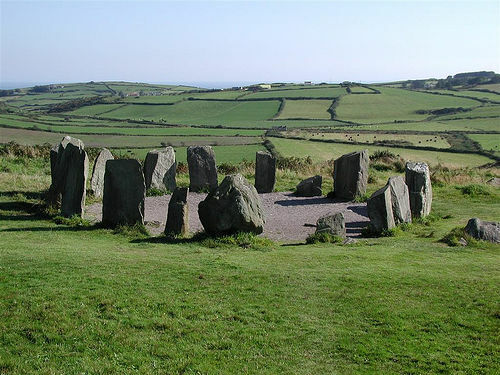 From there we carried on to Roscareberry and then on to the Dromberg Stone Circles. These were surprisingly impressive – just in a field, in the middle of nowhere – no major tourist shop, no charge – way, way more impressive than Stonehenge. We then carried on to Baltimore (no not the one in the US). Cute little town where we were staying at a somewhat upmarket B&B given to us as a birthday present- E60/2 plus another E7 each for breakfast. However it was pleasent in that overblown country theme styel with a great sea view and the luxury of an ensuite. Non-Stop Auckland Ireland – I Love JetLag! Smooth flight out of Wellington at noon heading to Auckland – though a little late leaving not a good start. AirNZ flight to connect with Emirates in Auckland. 2.5 hours in Auckland International Airport to check out the duty free and not do much else. Had to check in for the Emirates flights here – but the luggage was already tagged through to Cork – yeah right! I’m flying solo as my partner has to b et work until Good Friday (and has less leave than me). He’d pulled an all nighter so I had to wake him to get me to the airport on time. Flying Emirates for the first time – they fly primarily to Australia but heavily discount the Auckland/Australia leg just to fill the planes. I’ve never stopped over in the MIddle East before so I am looking forward to that on the way back and I like how it will break up that killer 12 hour Europe-Asia long haul leg. On the way over its a milk run flight with only abut an hour on the ground in Brisbane, Singapore, Dubai and 2.5 hours to sprint between Heathrow terminals to make the Air Lingus flight to Cork. Leaving Auckland at 5:45pm we leave Singapore at 6:45pm and Dubai at noon so I am hoping to sleep the Singapore – Dubai leg. Emirates stewardesses are in flash 50’s style pill box hats and mini-veils – their skirts are shorter than Air NZ’s hosties. They were generous on the checkin weight as I have a bag of stuff for the kids in Ireland – 21.5kg to be exact. The extra bag will come in handy though because we will leave it in Asia with the winter clothes we won’t need in Malaysia – packing for two distinct climates its a good idea to have a third bag to leave a hotel and collect at the end of the trip. Plane was 1/2 to 1 hour late leaving Brisbane and we never caught up the time. 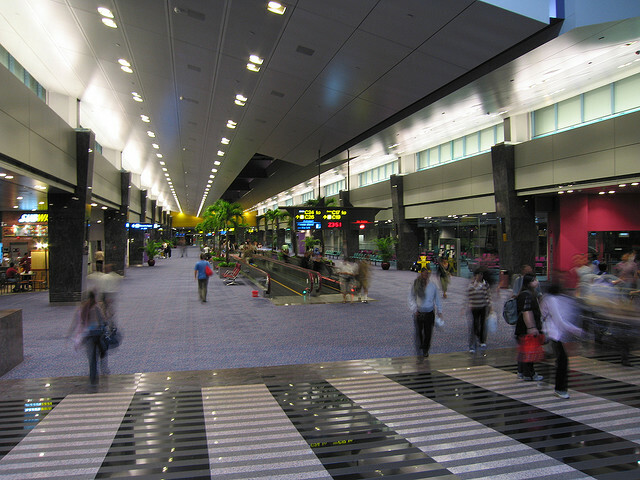 Only then had about 1/2 hour on the ground at Singapore’s Changi airport – still one my favourite airports in the world – free email can’t argue with that in the middle of the night. Nice inboard flight entertainment system though – especially if you need to improve your Tetris score! With only 20 minutes on the ground in Dubai -I didn’t see much of the super-modern airport as I was sprinting for the gate (and another security check). I would have made it (just) but the flight was delayed 1 hour anyways. It was at this point that my bag didn’t sprint fast enough and didn’t make the connection – but I would discover that much later. Arriving in Heathrow’s Terminal 3 – was a mess I had an hour to navigate the renovation mess, find the transit route, catch a bus, do security, check in, hike 15 minutes to the Air Lingus gate (why are they always the furthest away?) Did it in 50 minutes but I wouldn’t recommend it! The flight was on last call – but was late again as well. The luggage took another day to get to Cork – but was delivered to my door – by a taxi driver who called me for directions! Finally arrived Cork at 4:30 pm 4 April – which happens to be my birthday so I did get a birthday cake!